This is the nappie cake I made for my best friends who had a baby a couple of weeks ago. 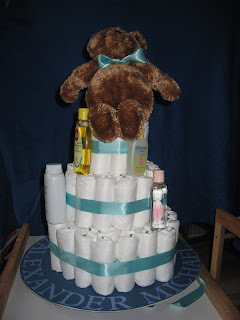 It's made up of 74 nappies, 3 metersof ribbon, several small bottles of baby toileteries, a small teddy and millions of elestic bands! It took ages to get it right, but it was worth it. I really hope they liked it.